SPRINGFIELD, OH--(Marketwired - July 23, 2015) - Konecranes (HEX: KCR1V) is a global leader in overhead lifting equipment with the largest team of industrial crane service professionals in the United States. 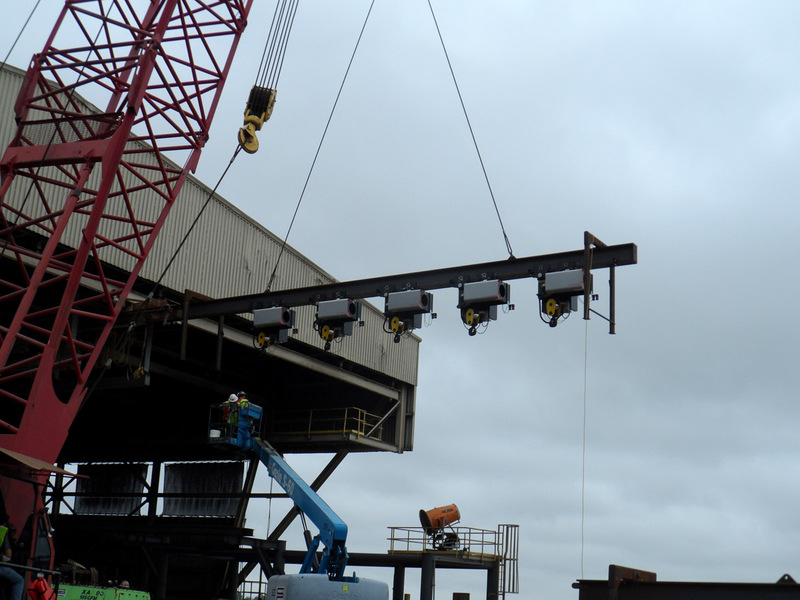 Its South Louisiana operations group recently replaced 24 8-ton hoists mounted on two overhead cranes used to lift and replace top covers on barges delivering grain. These two cranes unload over six million metric tonnes of grain each year, which is then loaded onto export vessels for shipment all over the world. The project was unique because all of the work done on the 225-foot cranes was performed from the water, using barges moored underneath them as a platform for the technicians. Each crane operates 12 hoists. According to Stephen Doyle, branch manager for Konecranes South Louisiana operations, CHS schedules an outage with Konecranes for two weeks every year to inspect the cranes and perform overhauls and repairs. "The cranes were new in 2000, so their original XL hoists were at the end of their life cycle this year," said Doyle. "We replaced them with current-design Konecranes CXT hoists rated for heavy dust and outdoor use and wireless internet capability for remote troubleshooting. The cranes are radio-controlled, and one radio control box can operate all 12 hoists on each crane." Planning for the outage was ongoing for more than a year. Nine Konecranes technicians were involved in the install, working from manlifts and a mobile crane mounted on four barges and a tugboat. According to CHS Maintenance Manager Brian Adams, CHS worked with the Konecranes engineers to come up with a system that would enable the team to install six hoists at once. "At one point we discussed installing the hoists one at a time, but we got together and came up with the idea to do six at a time," said Adams. "This added some cost to the job, but it allowed us to roll off 12 hoists from each beam in increments of six and roll 12 new ones on in increments of six. Each individual hoist weighs 3,000 pounds." The additional cost was for six beams that Konecranes engineered and designed. 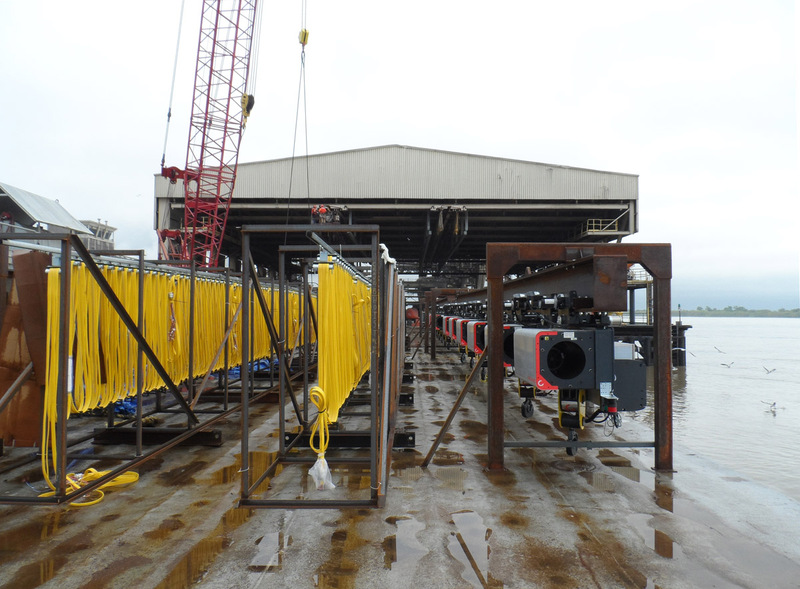 Four beams were used to stage six hoists each, which were hooked up and tested prior to installation. The other two beams were rotated to receive the hoists being removed. 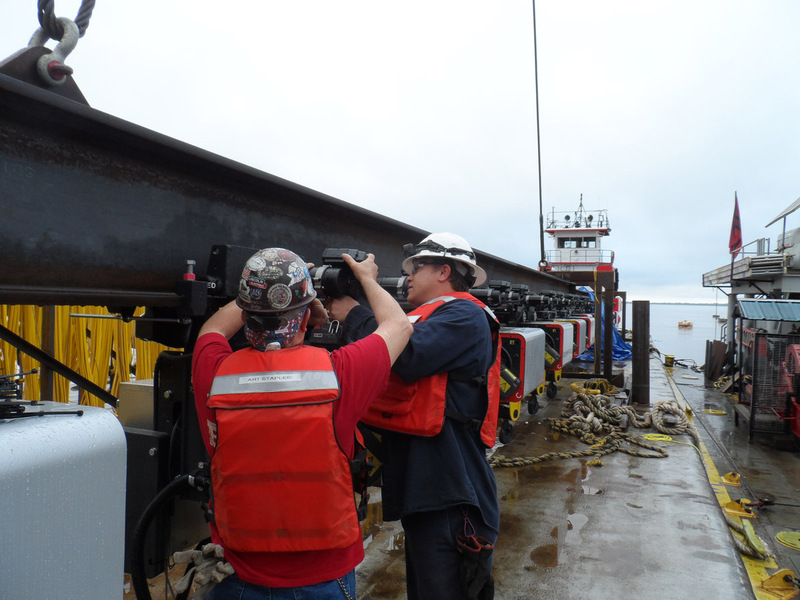 The loaded beams were attached to the crane girder with a special clevis pin arrangement also engineered by Konecranes. "We prepared the CXT hoists as much as we could on the ground, marking all the wiring so that when we went on the clock we could be sure that everything was ready to go," said Doyle. The outage was scheduled for the end of March, but relentless spring downpours delayed the project for several days. So the pre-planning that the group did to stage and streamline the install became doubly valuable to keep downtime to a minimum. "All of our inspections and maintenance have to be done in just two weeks each year," said CHS' Brian Adams. "We planned this out to make the job as expedient as possible, and Konecranes worked very well with us. Before we could initiate the project we had to finish up our production line, which was delayed because of the weather. So it was fortunate that we had a reliable partner standing by." In 2014, Group sales totaled EUR 2,011 million. The Group has 12,000 employees at 600 locations in 48 countries. Konecranes is listed on the NASDAQ OMX Helsinki. This press release is available at www.konecranesUSA.com.